Hatred is a trigger for sins. In order to protect our own interest, we easily become hateful when encountering friction with others. If this is not resolved, it can provoke us into retaliatory responses. When things get to this point, we cannot easily turn back. 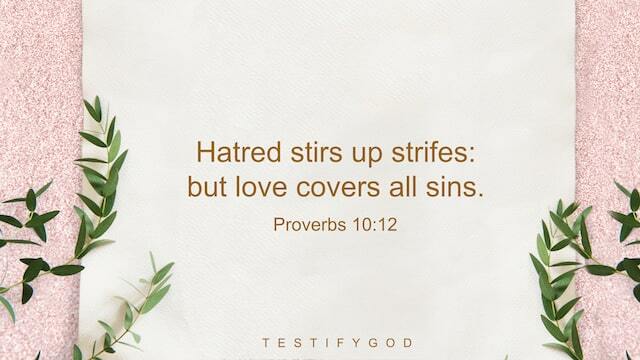 So this verse tells us, love covers all sins. If we can love each other, then it’s not difficult to work out our enmities. Especially before God, if we love Him, then we should obey all that God does. Even though what He does doesn’t conform to our conceptions, we still can put aside ourselves and continue to follow Him. God’s words say, “‘Love,’ as it is called, refers to an emotion that is pure and without blemish, where you use your heart to love, to feel, and to be thoughtful. In love there are no conditions, no barriers, and no distance. In love there is no suspicion, no deceit, and no cunning. In love there is no distance and nothing impure. If you love, then you will not deceive, complain, betray, rebel, exact, or seek to gain something or to gain a certain amount.” True love has great power. Hence, when something happens to us, if we can learn to put aside ourselves and be tolerant, and show love to others more, everything will turn better. Proverbs 14:15 “The simple believes every word: but the prudent man looks well to his going.” Reflection This verse wants to tell us that those who are foolish never discern others’ words, but blindly believe or obey every word they have heard. On the contrary, the intelligent and wise people are different. They handle others’ words with caution. If they do not understand, they can seek more instead of blindly following others or arbitrarily coming to conclusions. That reminds me when the Lord Jesus appeared to work, the Pharisees stubbornly held on to their own conceptions and imaginations and were against God. They spread various rumors slandering and condemning the Lord Jesus, and also incited and deceived the people into rejecting Him. Many Jewish people were deceived by their rumors and didn’t seek or study whether the Lord Jesus’ expression is the truth, the voice of God, and whether the Lord Jesus is God Himself. Instead, they blindly listened to the Pharisees’ devilish words, rejected the way of repentance preached by the Lord Jesus, ultimately followed the Pharisees in resisting God, and forever lost God’s salvation. By contrast, regardless of how many rumors and nonsense the Pharisees spread, those who truly followed God were cautious toward the Pharisees’ words. They neither blindly believed the Pharisees nor were deceived by their rumors, but carefully listened to God’s words and actively sought the true way. Eventually, they, convinced that the Lord Jesus is God Himself, resolutely followed God, and received His great salvation. From this, we can see that when God’s new work comes upon us, we may hear someone yell “Behold, the bridegroom comes; go you out to meet him,” we may also hear someone fabricate rumors discrediting God’s work as the Pharisees did. So, in matters that we do not completely understand, we must be cautious, focus on seeking the truth and studying the true way and listening to God’s voice. This is wise and prudent men. If we hear someone testify “the bridegroom comes,” we neither seek nor study but blindly listen to rumors and falsities spread by others. This is our folly. Then in the end we are the ones who will suffer a loss. » You may be interested in reading more on our Second Coming of Jesus Christ page, or in the articles below. • Beware of the Pharisees’ Leaven on the Path to the Heavenly Kingdom • Christian Testimony: The Path to the Kingdom of Heaven Is Narrow • Christian Movie “Deadly Ignorance”: Who Should We Listen to in Welcoming the Lord’s Return Peace be with you all! Dear brothers and sisters, if you have any understanding or enlightenment from God, you’re welcome to share with us.1. Via the online chat window at the bottom right corner of the screen.2. Send an email to info@testifygod.org.We sincerely hope we’ll grow spiritually through sharing with each other. Proverbs 4:22 “For they are life to those that find them, and health to all their flesh” Reflection God not only provides us with material things, but bestows rich truths upon us. He guides us forward so that we won’t go astray in doing things. When we gain the truth God bestows to us, we gain the life, which is to say, we gain God. Because God Himself is the truth, the way, and the life. God says, “The way of life is not something that can be possessed by just anyone, nor is it easily obtainable by all. That is because life can only come from God, which is to say, only God Himself possesses the substance of life, there is no way of life without God Himself, and so only God is the source of life, and the ever-flowing wellspring of living water of life.” The Lord Jesus promised that He would come again. It is now the last days, the prophecies of the Lord Jesus’ return have been fulfilled. We welcome the Lord’s appearance, then we will have the opportunity to gain the life bestowed by the Lord. So, how will we welcome the second coming of the Lord? Click here to see more: • Key Principles of Welcoming the Lord’s Return • Watch and Wait for the Return of the Lord • How Will Jesus Return? Have You Welcomed the Return of Jesus? Peace be with you all! Dear brothers and sisters, if you have any understanding or enlightenment from God, you’re welcome to share with us.1. Via the online chat window at the bottom right corner of the screen.2. Send an email to info@testifygod.org.We sincerely hope we’ll grow spiritually through sharing with each other. Proverbs 4:23 Keep your heart with all diligence; for out of it are the issues of life. Reflection In today’s verse, it mentioned that we should keep our hearts, Then why does here stress the importance of keeping our hearts? Most of the time, our deeds reflect our thoughts. No matter in life or work, when we have conflicts with others, we will easily develop prejudices against them, and even grudge them as time goes by. If we don’t keep our hearts, it’s easy for us to harm others. So what should we do to keep our hearts? Jesus said, “And all things, whatever you shall ask in prayer, believing, you shall receive” (Mat 21:22). God is almighty. We can ask Him to keep our hearts so that we can overcome Satan’s temptations and not do things based on our hot-bloodedness. There’s a passage saying like this, “Through mankind’s cries God gives them what they need, but He does not ‘reside’ within them at first. He just constantly gives them aid because of their cries and people gain hardiness from that internal strength so that Satan dare not come here to ‘play’ at its will. This way, if people constantly connect with God’s Spirit, Satan dare not come to disrupt.” When we call on God sincerely, He will surely help us. » Recommended for you: • Building a Good Relationship Is Not a Problem Anymore • 4 Tips for Christians to Get Along With People and Build a Good Relationship • 3 Principles of Prayer Help You Keep Temper Peace be with you all! Dear brothers and sisters, if you have any understanding or enlightenment from God, you’re welcome to share with us.1. Via the online chat window at the bottom right corner of the screen.2. Send an email to info@testifygod.org.We sincerely hope we’ll grow spiritually through sharing with each other. Proverbs 12:18 “There is that speaks like the piercings of a sword: but the tongue of the wise is health.” Reflection This verse tells us that while getting along with others, everything we said should not harm others but edify them. In daily life, when others are sad for hardships, failure or setbacks at work, what they most want is our comfort and support. If our words are rash ones like sword thrusts as described in this verse, instead of comforting and helping others, we will cause them greater pain. If we blindly lecture others, they will become weaker. But instead, those who understand the truth are possessed of wisdom. They don’t rely on hot blood to treat others, but first understand others’ difficulties and help others with a loving heart. Share a passage of God’s words: “When one of your brothers and sisters is weak, you will not loathe them, despise them, make fun of them, or give them the cold shoulder. If you are able to be of service to them, you will commune with them and say, ‘I used to be passive and weak. I really did not want to attend an assembly, but something happened through which God enlightened me inside and disciplined me; I was reproached inside, I was so ashamed, and I always felt sorry toward God. Afterward, I dedicated myself to the life of the church, and the more I engaged with my brothers and sisters, the more I felt I couldn’t do without God. When I was with them I didn’t feel lonely; when I was shut in a room by myself I felt lonely and friendless, I felt that my life was empty, and my thoughts turned to death. Now that I was with my brothers and sisters, Satan did not dare to do its work, and I did not feel lonely. When I saw how strong the love for God of my brothers and sisters was, I was inspired, and so I was always with my brothers and sisters, and my passive state naturally disappeared.’ Hearing this, they feel that it is useless to pray at home, they still feel that there is no love between their brothers and sisters, that their life is empty, that they have no one to rely upon, and that it’s not enough to merely pray. If you commune with them this way, then they will have a path by which to practice.” More related articles about how to treat others with a loving heart: • A Christian Teacher’s Story: She Apologized for Her Anger Toward Her Student • How to Live in Harmony With a Stroppy Roommate • Bible Verses About Loving Your Neighbor as Yourself Peace be with you all! Dear brothers and sisters, if you have any understanding or enlightenment from God, you’re welcome to share with us.1. Via the online chat window at the bottom right corner of the screen.2. Send an email to info@testifygod.org.We sincerely hope we’ll grow spiritually through sharing with each other.